Tony Stewart Estate Auction — Harritt Group, Inc.
7% Indiana Sales Tax on titled vehicles. Selling live on site the lifetime personal property collection of Kathy and her late husband Tony Stewart. 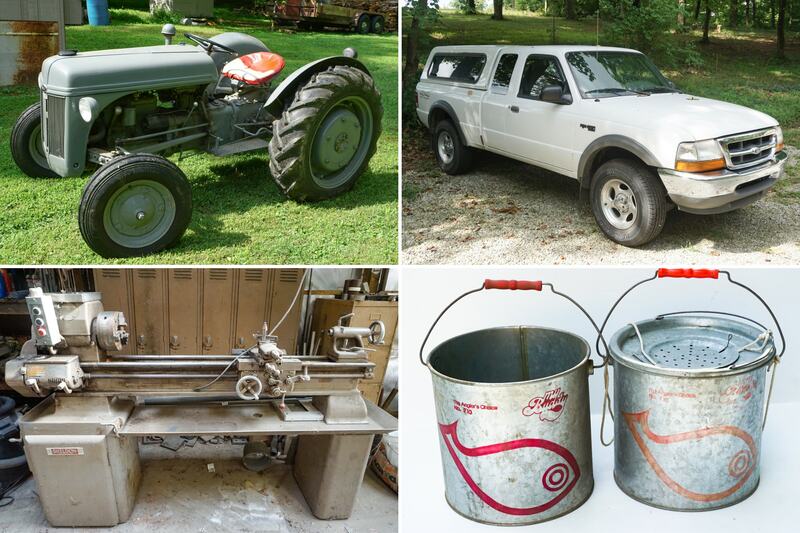 Highlights include a 2000 4×4 Ford Ranger XLT, 2000 Saturn SL1, 1947 Ford 2N Ferguson tractor, farm equipment, personal sailboat, (2) industrial lathes, large selection of tools and shop equipment, antiques, furniture and more. 1947 Ford 2N Ferguson tractor in running condition, Snapper riding lawn mower, Snapper push mower, heavy duty single axle flatbed trailer, retro 5HP rototiller, Douglas MFG 60” finish mower, 3 point disc, 3 point cultivator, scoop, grader blade, chicken tractor, carry all and single plow. Early F.F. Reed line driven metal lathe – converted to electric, 16” throw, Sheldon Machine metal lathe, 220V air compressor, acetylene tanks, Craftsman 2.5 HP radial arm saw, Tradesman electric drill press, Central machinery band saw, electric sander, DeWalt 734 planer, 90 AMP flux wire welder, bench grinder, shop dust collector, Craftsman rolling tool chest, Matco rolling tool chest, old military engine, several electric motors, floor jacks, jack stands, wood planes, air cylinder, 6’ x 3’ heavy-duty steel table, nuts and bolts, large industrial metal box, bar clamps, large selection of electric power tools, hand and yard tools, drill bits, rough cut lumber, blue industrial shelving oil fuel tank, waste oil heater, industrial iron wheels, Rubbermaid plastic storage unit, beehive equipment and many more surprises to come from the contents of entire detached pole barn garage including large selection of scrap metal. Maple end table, round maple tiered lamp table, antique victorian three quarter bed with custom-made Bowles mattress, maple 5 drawer chest,1930’s chifferobe, indoor natural finish wicker set tea includes side chair and stand table with tropical cushions, vinyl wicker rocker, vintage bentwood bistro set with round cane top table and (2) matching chairs, retro 1970’s Dixie walnut dresser with mirror, antique quilt frame, maple dining table and (6) chairs, small oak office desk, green plaid sofa and loveseat, retro oak sideboard, (2) metal desks, cherry china cabinet, white linen cabinet, Frigidaire electric range, dishwasher, microwave, treadmill and more. RCA Victor VV-V1 Talking Machine, 78 RPM records, record cabinet, homemade wood shaving house, 4’ limestone cistern stone, antique well pump, large selection of stoneware crocks and jugs, Dazey four quart churn, Purity Made milk bottles, Blue ball jars, (4) Cast iron bird baths, planters, (2) large metal Texaco oil drums, (2) sets of industrial metal lockers, galvanized wash tubs, galvanized bread box from Honey Krust, side irons, tea kettles, insulators, Falls City beer memorabilia, cast iron bank, vaseline glass, vintage lunch boxes includes The 6 Million Dollar Man and Walt Disney’s America on Parade, oil lamps, Tonka car carrier, glass soda bottles, Renn bottle, vintage Floyd and Harrison county plat books, coal hodge, H.F. Byrd wood crate, red and white china set, Chatillon scale, Montana acoustic guitar, dozens of baskets, Christmas village houses, Budweiser cast iron Clydesdale horse drawn beer carriage, ice tongs, old Webster dictionary, William Hancock and Ray Day prints, pickler jar, granite lunch pale, Nutcracker, dolls and much more. I-64 to Georgetown Exit 118. West on IN-62 for .7 miles, turn right onto Corydon Ridge Road for 2.7 miles, turn left onto Old Salem Road for ½ mile with auction on right.